The packaging is nicely done, with the Switch and Joy-Con front and center upon opening the box. This is easily the smallest overall box for a home Nintendo console, although that makes sense because it's really part handheld device. The Switch itself and the two Joy-Con are front and center when you open up the box, with the rest of the accessories below: TV docking station, the Joy-Con grip, two slide covers for the Joy-Con, the USB-C power cable, and an HDMI cable. You won't find much in the way of paper manuals, and all the contents fit nicely. It's definitely not quite as luxuriously crafted as, say, an Apple product, but it made for a nice, quick unboxing experience. Now, let's dive into the important stuff. The most striking thing you'll probably notice about the Switch isn't the console itself: it's the two Joy-Con. For me, they are just big enough as to still be comfortable, but I can see them being a little too small for anyone with larger hands. The analog sticks aren't as nice as the PS4, the Xbox One, or even the Wii U; but they are easily a step up from the 3DS and even the Vita. The face buttons are nice and clicky, (if a little small for a home console), but you'll notice that the Joy-Con (L) has four directional buttons in lieu of Nintendo's signature D-Pad. This is one of the biggest departures for Nintendo, as I'm not sure I can recall any other Nintendo console (home or handheld) that did not have a D-Pad input device out-of-the-box. That said, the Pro Controller (sold separately) does have one. 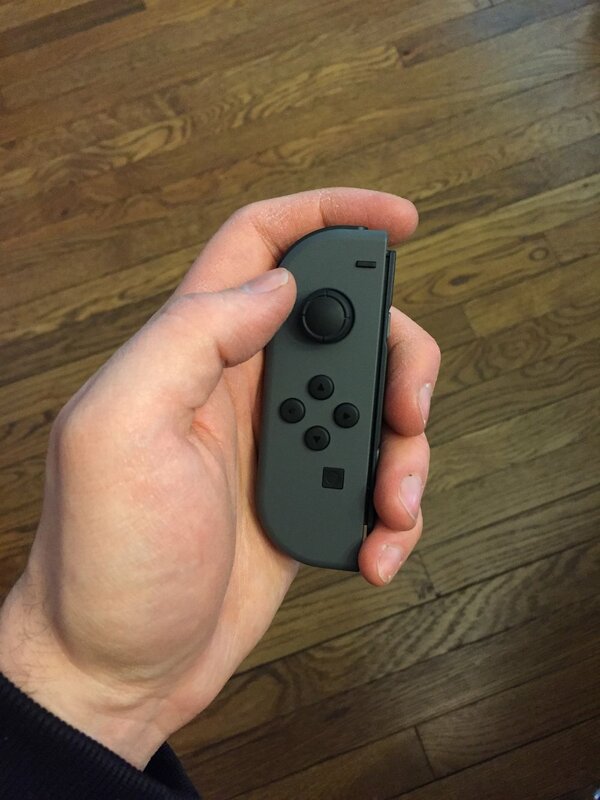 The Joy-Con Grip, pictured above, lets you combine your two Joy-Con into a more traditional-looking controller. While it is also smaller than a traditional controller, it works even better than I had imagined. Still, it's a little weird that Nintendo is selling a separate Joy-Con Charging Grip, which looks identical to this one with the added functionality of having its own battery that can charge the two Joy-Con. That means that the only way to charge the included Joy-Con is by having them attached to the Switch tablet itself, although their battery life (around 20 hours each) means that this will likely not be a big issue. The real guts of the Switch are all housed in the main tablet body of the device. It is also surprisingly small (by now, you may be sensing a running theme here), but the build quality is nice enough. It does have more ports and openings than most traditional tablets have (there's a kickstand that conceals a MicroSD card port, speakers, a game card port, a USB-C port, a giant fan vent, and the Joy-Con rails along the sides), but it still manages to look sleek enough. Visually, the Switch is very similar to a slightly-smaller, first-generation Kindle Fire, as it has an additional thickness when compared to most modern tablets. That's not to say it's clunky, but they've definitely given the device a little extra breathing room for graphical performance compared to much of the tablet market. I like that the back features the system logo, as it adds a little bit of Nintendo fun to an otherwise very serious-looking machine (at least assuming you have the grey Joy-Con, as the neon controllers add some additional spice to the look of the console). All assembled, it's definitely longer looking than most people are used to for a tablet, but it doesn't feel awkward to hold. Your fingers can rest comfortably against the back, as there's no "back touch" (like the Vita) to worry about your fingers accidentally grazing while playing. Sometimes I find the right analog stick a little awkwardly placed, but it depends on how your hands are positioned on the device. This may sound ridiculous to anyone who complained about the Wii U's analog stick placement, but I think I agree with Nintendo's previous decision to, on that device, put both analog sticks in the "top" position. With a tablet-style device, that just feels more comfortable; however, that would have created issues for using the Joy-Con separately for local multiplayer. I can ultimately live with the offset sticks, but I do think the Wii U was onto something in this regard. One other gripe is that the screen is plastic—not Gorilla Glass, as used on iPhones and most touch devices these days. While obviously a cost-saving measure, it's a disappointing choice that is already leading to Internet reports of scratched screens. 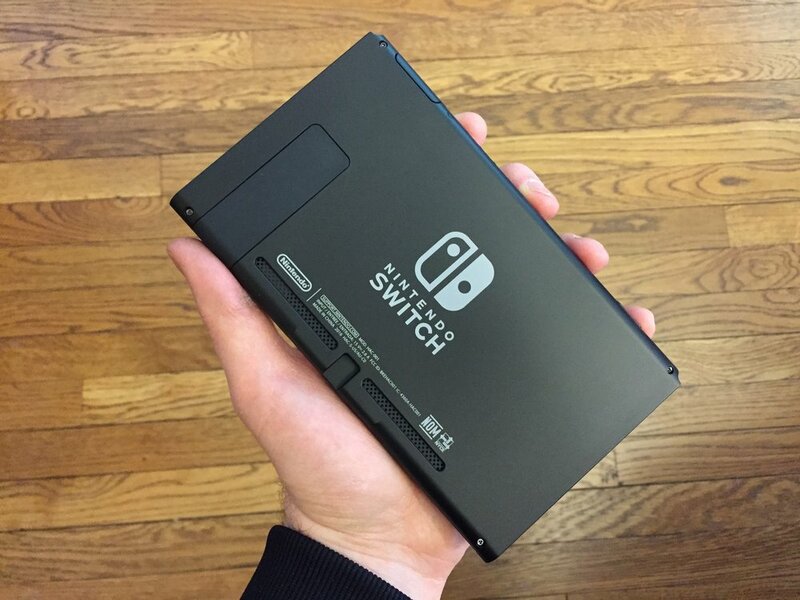 On that note, I recommend taping a black microfiber cloth on the inside of the Switch's dock to avoid scratches while taking the Switch in and out. There are various YouTube videos if you want more information on this. DIY fixes for some imperfect hardware designs aside, I like the design of the Switch. Aesthetically, it's a mixture of very un-Nintendo design (the tablet looks very standard and it's weird to not have a real D-pad) and extremely Nintendo (the system looks pretty goofy in that dock, although the fact that it's all black plastic helps it not stand out). Even the operating system is a blend of old and new Nintendo. It's generally a pretty sterile affair with a lot of white screens and blank space. The OS is quick and responsive, but it lacks any music or typical Nintendo charm. You won't see Miis gathering in a plaza like the Wii U or customizable stickers and themes like the 3DS. You will, however, find some fun and very Nintendo content in the "News" section, which can be viewed on the lock screen when waking the device or in a full-screen mode. Oh, and the ability to make Miis is still there—you'll just need to dig through some menus to find it. As much as Nintendo has positioned the Switch as a home console you can take on the go, I view the Switch oppositely: a handheld that can go big when you need it. I have only tried playing my Switch on TV once so far, and I much prefer curling up with it in bed or on the couch in handheld mode. I've even tried tabletop mode just to free up my hands, which has enabled me to sit more comfortably at a table or play lying down with my hands at my sides (this makes me feel like I'm controlling Link with my mind). On that note, a few quick words about the games—mainly The Legend of Zelda: Breath of the Wild. This game is really good. Like...really, really good. I was honestly a little unsure about an open world Zelda because I've grown fairly tired of Grand Theft Auto and other open world games: the formula can be stale, the controls can be sub-par, the missions can be repetitive, and the grand scale of the world can ultimately end up being a facade for an otherwise very shallow game. Breath of the Wild has none of these problems. There's more to write about this game than I can fit in this post, but I am specifically impressed by the way the game handles forests. "Forests, really?" you may ask. Yes, forests. In so many adventure games, forests look cool but are actually pretty restricted. You have one main path through them, and they're really just fancy-looking corridors. In Breath of the Wild, you can walk through any forest, climb any tree, chop down any tree, and so on. This sort of design philosophy where you really can go anywhere is refreshing to the point of being groundbreaking. The other big launch game I've tried is 1-2-Switch, the party-focused mini-game collection. While it's not deep at all, it's the best way to see the potential of the Joy-Con's motion sensing and HD rumble. It also makes for a pretty hilarious party game. You can quickly get some hilarious moments out of this collection, including milking a cow, rocking a baby, passing around an increasingly fizzy bottle of "soda," and having a wizard's duel. The Ball Count game, in particular, is really the best way to show anyone what "HD rumble" really means. Somehow, the controllers manage to make you feel virtual marbles that seem to be rolling around inside the Joy-Con. I don't really understand how this works, but it's very impressive. Despite all of that, the game feels overpriced at $50 and really should have been a pack-in game, as it would have been far easier to love as a glorified tech demo, since that's really what it is. Still, the gadget nerd in me appreciates having the software that can show of the hardware's tricks. The Switch is a great piece of hardware with tons of potential and neat options, but you certainly don't need one right this second other than to play Zelda (which you should definitely be playing). If you're a Wii U owner who doesn't mind being tethered to your home console, all reports indicate that the game runs about the same on the last-gen console. However, when viewed as a handheld gaming device, I think the system quickly becomes more of a must-have. This is what the PS Vita was meant to be, and it fits perfectly into my lifestyle where my wife might want to watch YouTube on the TV, my daughter is occupied with her Kindle Fire, and I want to complete just one more Shrine in Breath of the Wild. Screens are becoming more and more personal, so the mobile-first approach of the Switch (despite Nintendo's marketing claims) make it a very forward-thinking console indeed. The big screen is a nice-to-have option for parties, but I'm confident the Switch will make its name as an incredible handheld. I think the coming months will help the system make a better case for its existence: more games are on the horizon (with an impressive slate of independent titles announced), the potential for some non-gaming apps (a web browser + Netflix/Hulu/Amazon would be nice), and more information around Virtual Console (a glaring omission from the eShop) are all needed developments for the system. For now, though, this is a really fantastic Zelda machine with a bright future.